A recent obituary made me reflect upon a rainy Saturday afternoon at Urbana, Ohio's Grimes Field two years ago and the stories I never got around to writing. Due to the focus of this blog, I rarely share very intimate details of my life for everyone to share; however, I will make a small exception for the purpose of this post. For the past 4-plus months, I have not held a position in my current profession and I have been actively seeking related employment of any sort since the end of January. A discovery yesterday morning during what has become my everyday routine painfully highlighted the greatest shortcoming in my pursuit of a full-time journalistic career--following through on what I start. When I was perusing the online edition of The Dayton Daily News, I saw what I thought to be a familiar face on the obituaries page. While I don't scour every single announcement, this one had a photo and it instantly attracted my attention. It told me that David W. Scheff, 51, of West Liberty, Ohio died this past Friday after a 5-year battle with cholangiocarcinoma, an extremely rare (only 1-2 cases per 100,000 in the Western world) form of cancer that affects the bile duct and was the same disease that took the life of Hall of Fame football great Walter Payton at a comparable early age. The provided photo was one of him wearing the uniform of a US Air Force senior non-commissioned officer, a strata I also achieved while serving on active duty. It wasn't until I started reading the details of his career that I instantly realized that we had met before. 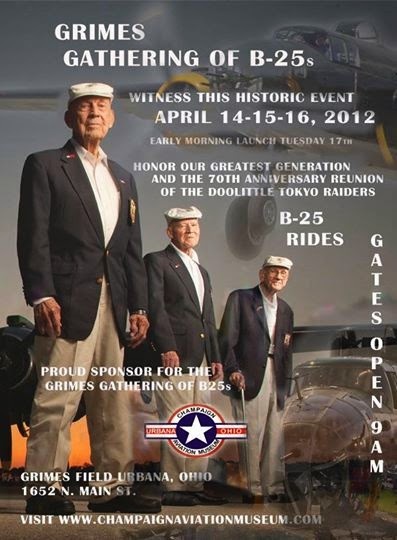 A copy of the poster promoting the Doolittle Raiders'-related activities at Urbana, Ohio's Grimes Field in April 2012. Back in April, 2012 I was planning on covering the local activities associated with the 70th reunion anniversary for the remaining "Doolittle Raiders", a group of men made famous for their daring April 1942 bombing raid on the Japanese mainland. Of the original 80 B-25 crew members who took off from the deck of the aircraft carrier USS Hornet deep in the western Pacific Ocean, seven lost their lives as a result of that mission and another 10 were killed on subsequent missions during various World War II campaigns. In the years since the end of that conflict, the surviving members gathered almost every year to honor their fellow Raiders who had passed away since the previous event. The 2012 event was billed as the final reunion (there was a 71st in 2013 and three of the four remaining members held a "final toast" last November). The events two years ago were going to be held at two locations: Grimes Field in Urbana, Ohio and at the National Museum of the United States Air Force in Dayton, about a 30-minute drive away. It was at the former place that our two lives intersected. 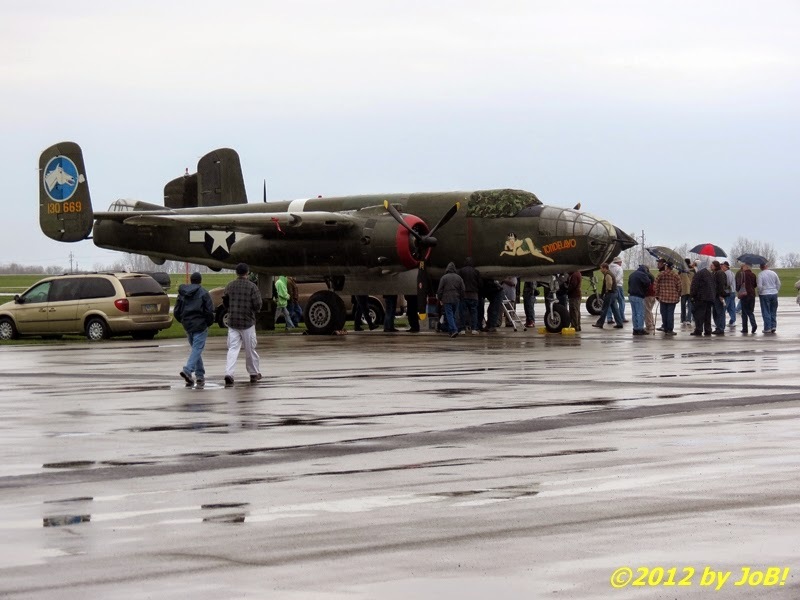 Spectators taking a closer look at two B-25 bomber aircraft on static display at Urbana, Ohio's Grimes Field in April 2012. Over the next five hours, I took in the sights and sounds at and around Grimes Field, to include 159 photos and 9 short video clips. I had the opportunity to interview several people associated with the event (pilots, vendors, aircraft restorers, a former Air Force One maintainer, and a 93-year old World World II veteran) that I will incorporate those discussions into upcoming stories from today's as well as next week's events surrounding the Doolittle reunion. Being on my feet for all of that time, I was starting to feel my age when the rain started falling heavier and was forecast to stay that way for the rest of the day. I had thoughts of keeping the credential and coming back on Sunday when the weather was expected to be a lot better; however, I was politely reminded by my smartphone that I already had previous commitments and, sadly, made my way over to the hangar to turn it back in. David was the Air Force One maintainer I alluded to in my coverage. It was an accidental meeting but one that I now look back upon as one of several missed opportunities from that event that should have made it to this web site. 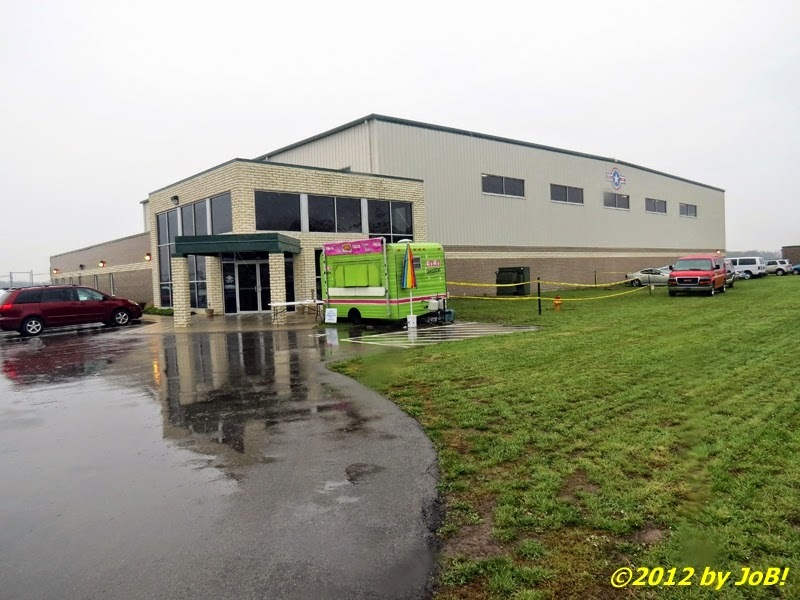 The outside of the Champaign Aviation Museum in Urbana, Ohio. The weather on that April Saturday was not very pleasant (chilly with misting rain and a strong sporadic breeze that got worse as the day went on) so being indoors or under shelter was the place to be. 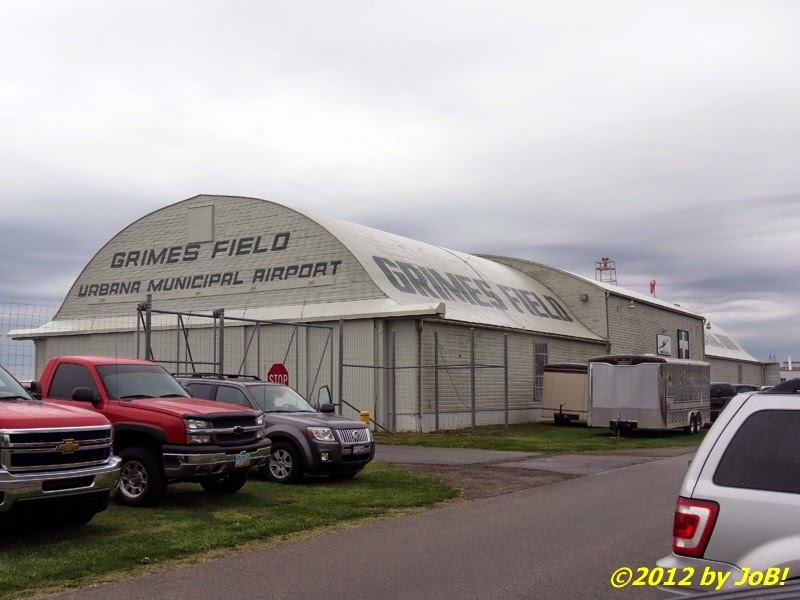 The Grimes Airfield area has several aircraft-related buildings on and along its flight line and one of the larger ones is the Champaign Aviation Museum. Established in 2009, its main claim to fame is being the home of the Champaign Lady, a Boeing B-17 Flying Fortress bomber in the process of restoration and the Champaign Gal, a fully restored North American B-25 Billy Mitchell model. 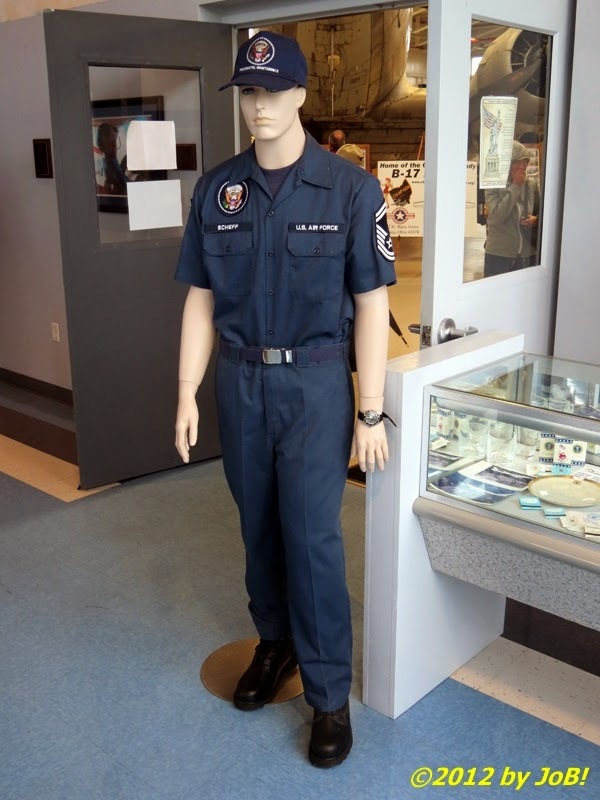 A mannequin displaying the Air Force One crew member uniform worn by SMSgt Scheff while on active duty stands inside the lobby of the Champaign Aviation Museum in Urbana, Ohio. When I walked into the lobby area, I saw several displays of general aviation but what struck me most was a mannequin dressed as a Air Force One maintainer near the entrance to the larger hangar spaces. Maintenance personnel for most Air Force aircraft wear their general utility uniforms (a version of the battle-dress uniform or the more-recent ABUs) but those selected to work on special teams or missions get to wear the distinctive all-blue ensemble pictured above (you can see the seal denoting presidential activity above the right shirt pocket). Right next to the mannequin was a display case with assorted memorabilia from that aircraft. With my then-recent rejection of covering President Obama's arrival to Wright-Patterson Air Force Base for the NCAA men's college basketball game with British prime minister David Cameron still on my mind, my mind started to consider what could have been (and what eventually did happen later that same year). 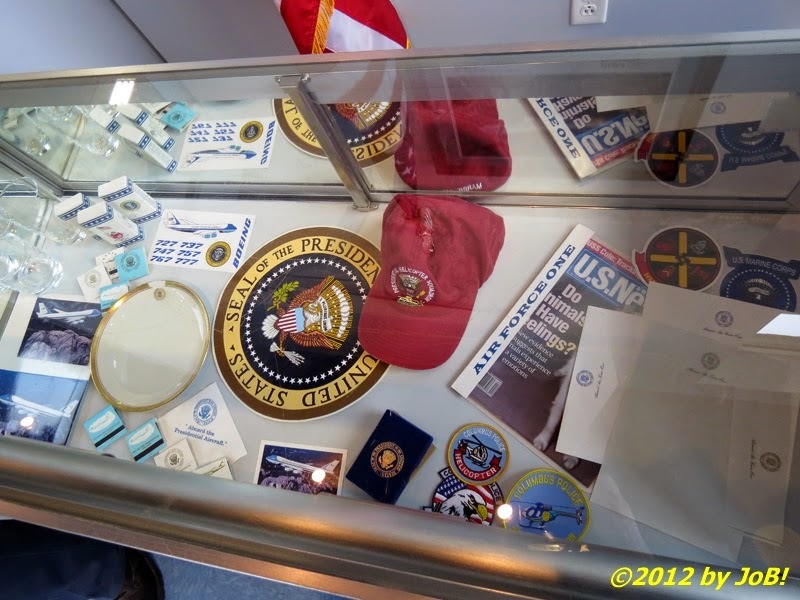 Several Air Force One-related memorabilia items on display in the lobby area of the Champaign Aviation Museum in Urbana, Ohio. 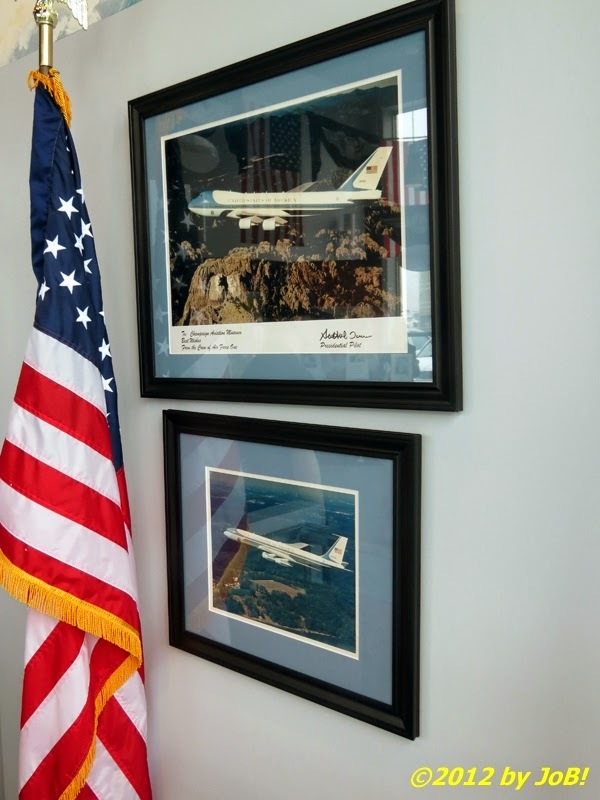 Two framed photographs of the current and previous versions of Air Force One hanging in the lobby area of the Champaign Aviation Museum in Urbana, Ohio. Armed with my camera and DVR, I made my way into the museum's main hangar and wandered around the various exhibits looking for journalism-worthy items. Several vintage aircraft were on display, including a rain-speckled Champaign Gal that had been recently rolled inside the facility from the outdoor apron area. A much cozier environment than the Air Force's local museum, groups of visitors congregated around several tables and displays and it was at one of those places where I met Joseph Peterson, a then 93-year old World War II veteran who was sharing his military experiences while serving in the US Army Air Forces in Europe. At another area, I talked with Steve McDevitt and Christine Lesko who were representing History Flight Inc., a company that operates a restored B-25H aircraft named Barbie III and sells rides at aviation-related events to help fund the repatriation of missing-in-action (MIA) service members from burial sites in remote World War II battlefield areas. Then 93-year old World War II veteran Joseph Peterson of Monroe, Michigan telling tales of his service in the US Army Air Forces. Unfortunately, I didn't record Peterson's remarks or get a photo of the History Flight personnel so I rated them as "incomplete" sources for additional work. One person that I did photograph and record our interview was Chris Koehler, a then 32-year old computer professional from the Columbus area who was doing restoration work on the Champaign Lady. During our chat, he told me that he was a B-17 "freak" since he was 10 years old when he and his dad saw Sentimental Lady, a plane associated with the Confederate (sometimes called Commemorative) Air Force, make an appearance at a local airshow. Having no mechanical skills other than working on cars, he started volunteering at the museum in 2011 and had progressed to doing hands-on fabrication activities (with the guidance of individuals more experienced with the airframe). 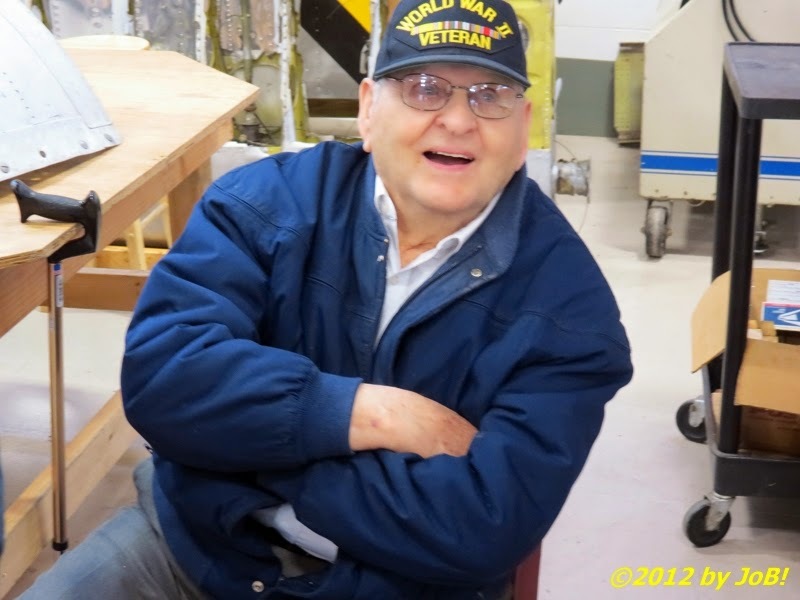 While the aircraft being worked on was built in 1944 and never saw combat, it is being refurbished by Chris and other volunteers to serve as a memorial to the planes that did and the crews that flew on them. Enduring a painstakingly slow and expensive process, the Champaign Lady is scheduled to be ready for takeoff in 2022. 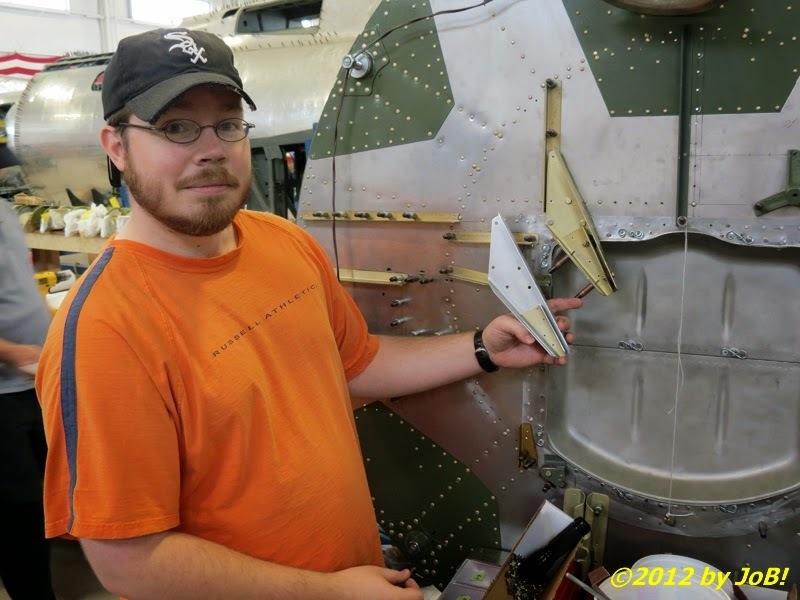 Columbus, Ohio native Chris Koehler shows off his fabrication handiwork at the Champagne Aviation Museum in Urbana, Ohio in April 2012. 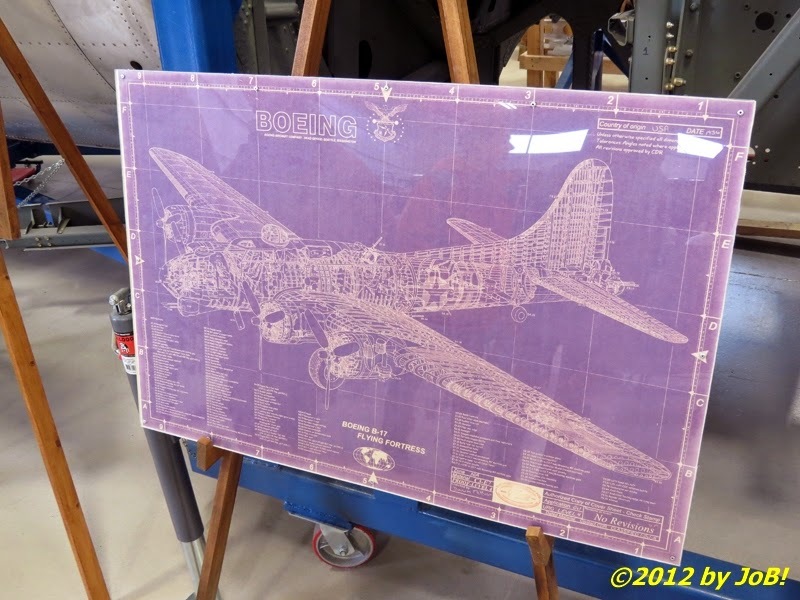 A copy of the blueprints for the Boeing B-17 aircraft from 1936 near the Champaign Lady restoration project inside the Champaign Aviation Museum in Urbana, Ohio. 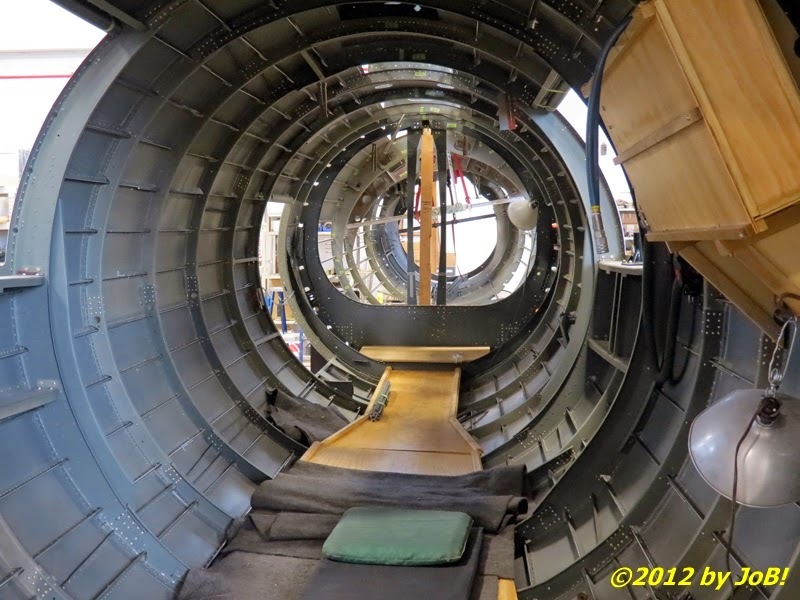 The interior of the Champaign Lady, a B-25 aircraft undergoing refurbishment inside the Champaign Aviation Museum in Urbana, Ohio. 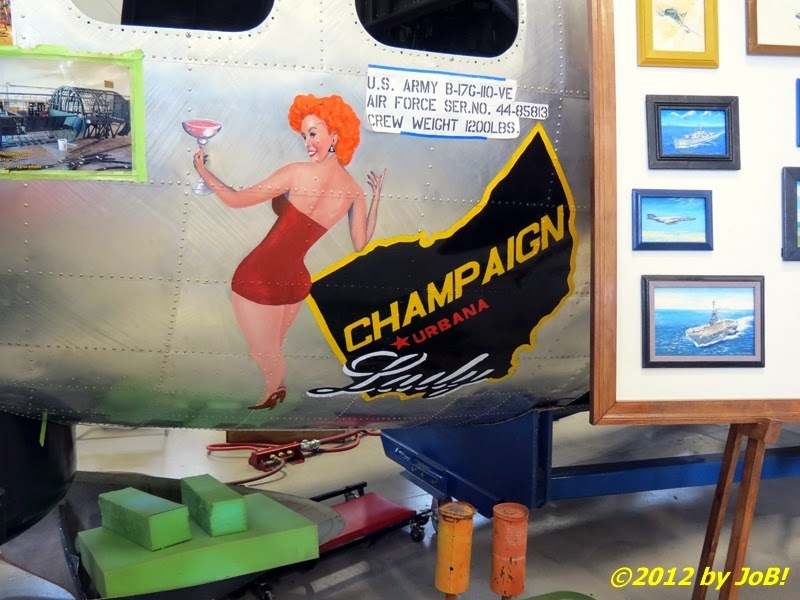 The nose art for the Champaign Lady refurbished B-25 aircraft inside the Champaign Aviation Museum in Urbana, Ohio. It was only through careful review of my photos from that day that I found two that included Sergeant Scheff (and neither one was taken with him as the subject or from a forward angle). He stood out from the crowd because he was wearing an Air Force physical training, or PT, outfit to stay warm and negate the weather's chilling effects. I walked over to introduce myself and when he reciprocated, I instantly connected him with the Air Force One-related items I saw earlier. During our seven and a half minute conversation, we immediately struck a rapport that comes with serving most of one's adult life in uniform. I found out that we had a lot in common (we both initially enlisted and retired in the same years) and he shared details of his 19 years working with the 89th Airlift Wing at Andrews Air Force Base, located in the Washington, DC suburbs of Maryland. 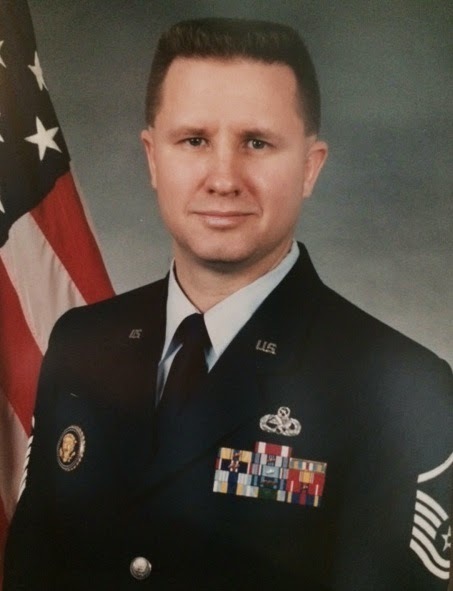 Initially trained to be an avionics communications specialist, he didn't know that he could apply for that kind of special duty until he read an article in Airman Magazine, an Air Force-wide PR publication (he admitted that before reading it he always thought it was the Secret Service's responsibility instead of the Air Force). After the initial selection and screening processes, he logged over 12 years of direct support in the Presidential Logistics squadron with both the VC-137 (Boeing 727) and VC-25 (Boeing 747) models. At one time, he was responsible for over 80 maintenance personnel who conducted both pre- and post-mission activities as well as in-flight tasks. Once he retired, he worked as an aviation consultant for Booz Allen Hamilton where he assisted Air Force clients from across the country on aircraft maintenance issues. He served as a board member of the museum and he donated his maintenance uniform and other items after being a guest speaker for one of their various public outreach events. 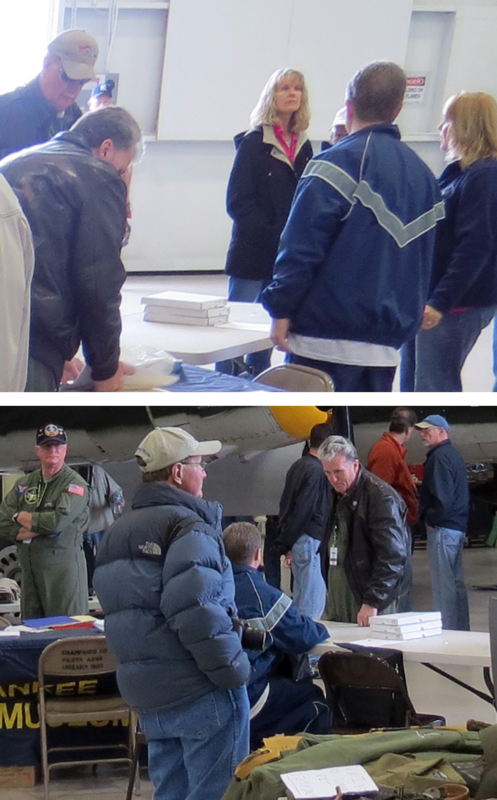 Close-ups of David Scheff (standing, top, and sitting, bottom, wearing a grey-striped Air Force windbreaker) talking with visitors at Grimes Airfield in Urbana, Ohio in April 2012. When David and I met, he was already battling the disease that eventually took his life late last week but he showed no outward symptoms of being ill and our short conversation didn't go beyond general or military-related topics. When I reviewed the recording, I noticed that I ended our talk with a comment that is now somewhat haunting considering recent events. When discussing the donated uniform, I stated that the display would "immortalize" him (although he quickly attempted to deflect any personal credit by saying--in a humorous tone--that it would make him "infamous" instead) and it was then that I made the connection to my often observed practice here on this blog. When a person tells a story in a publication or other modern medium, its contents can live on well beyond the storyteller. Compared to the processes required before the invention of writing, moveable type, magnetic media and online storage and dissemination methods, we can now easily "immortalize" (or "infamize") a person for the benefit of future generations. Sergeant Schiff's body may have failed much too soon but those selfless donations will help him--through his legacy and spirit--live on as long as that museum remains open. Similarly, my documentation of our chance meeting on that damp April day will hopefully further cement his distinguished reputation within the Urbana and Dayton aviation communities. Regrettably, I only wish that I had done this sooner and I will apply this unfortunate journalism--and life--lesson to my future assignments. 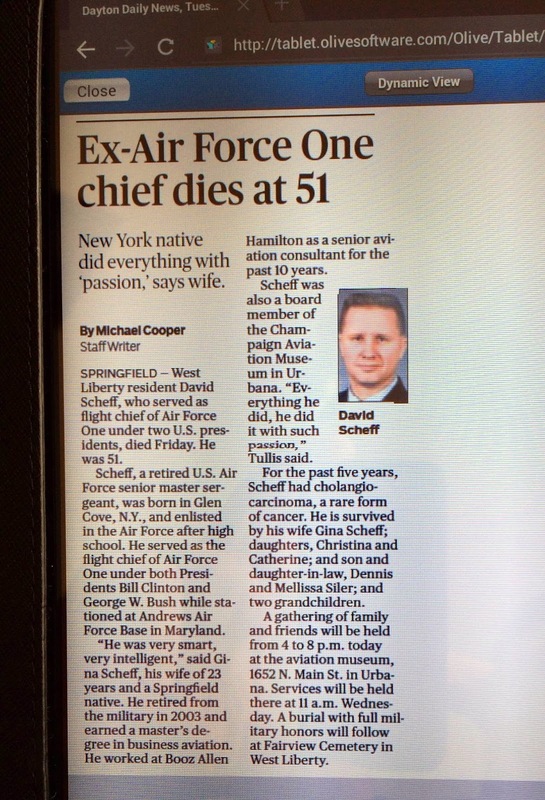 UPDATE (5/6/2014): A feature story about SMSgt Scheff's passing and life appeared in today's edition of The Dayton Daily News. Please let Gina know that she can contact me directly at journalismorbust@gmail.com.